High Quality Content by WIKIPEDIA articles! The Arabian Desert is a vast desert wilderness stretching from Yemen to the Persian Gulf and Oman to Jordan and Iraq. It occupies most of the Arabian Peninsula with an area of 2,330,000 square kilometers (900,000 mi²). At its center is the Rub'al-Khali, one of the largest continuous bodies of sand in the world. Gazelles, oryx, sand cats, and spiny-tailed lizards are just some of the desert-adapted species that survive in this extreme environment, which features everything from red dunes to deadly quicksand. The climate is extremely dry, and temperatures oscillate between extreme heat and seasonal night time freezes. It is part of the Deserts and xeric shrublands biome and the Palearctic ecozone. This ecoregion holds little biodiversity, although a few endemic plants grow here. Many species, such as the striped hyena, jackal and honey badger have become extinct in this area due to hunting, human encroachment and habitat destruction. Other species have been successfully re-introduced, such as the sand gazelle, and are protected at a number of reserves. 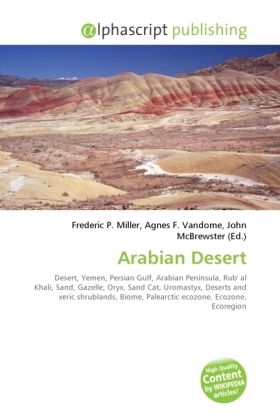 Overgrazing by livestock, off-road driving, human destruction of habitat are the main threats to this desert ecoregion.